So I am still sorting through this collection I purchased earlier in the year and came across 5 Monster Boxes worth of Topps Flagship Baseball Inserts from 2010-2017 (I already have a bunch of 2018's). The bulk of them are 2012-2015. My idea of getting rid of these was to sort through them , checklist them, and eventually put them on eBay in various types of lots. Before putting all the time and effort of listing each card/set, I figured my load might be lightened by seeing if I can fulfill some lists on "The Bench" and trade or sell off a bunch before recording them. If you are in need of completing any inserts or parallel sets from TOPPS in these years, lmk and I can shoot you a price. If you are looking to cherry-pick just the stars and rc's, please don't bother as I will need the "hook" cards in order to sell these on eBay. If you are only trading, I am in need of some 1969-1980 Topps cards to complete some base sets. ALL cards must be no less than exmt condition. I have lists already published of my 1969, 1971 & 1972 Topps baseball set needs. I am almost done with my 1974 list needs. I have not started on my 1973, 1975-80 lists yet but if I get enough traders interested, I will get some lists together fairly quickly. Otherwise, still looking for help with my Mets want list. If you are collecting parallels for sets or team collectors, I have many Topps and Bowman Golds from these years along with many other base/chrome refractors/other chrome colors. I have a 3 day weekend this week and will be trying to get all of this organized during that time. I am looking to unload large lots so please don't hesitate to ask about any cards during those years. Mike,any help with my parallel needs from all that stuff? Wantlist on my page is updated. I realize it's gonna take time but lemme know when you can. Eh,it's not much but it's something. Found a couple for you. Mike - I think you also need this one? 2001 SP Game Bat Edition Milestone - Piece of the Action Bound for the Hall #B-MP Mike Piazza. Also any interest in this one? 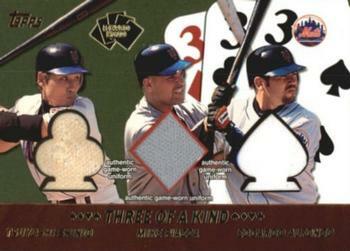 2002 Topps 5-Card Stud Three of a Kind Relics #5T-STA Shinjo/Piazza/Alfonzo. Last edited by NYBBNUTT; 09-03-2018 at 07:43 AM. Can use those Ron. Not a high priority. What can I get you besides the orig back inserts? Doubt I have many of them...if any. LMK. Still need to look.